"Which putter type should I choose?" is the least often asked, but most crucial question to consider when you're buying a new flat stick. Certain putters will support the type of stroke you're looking to use and others will hinder it, so choose wisely! Below is a guide to the different types of putter arranged by head /face material, head design and balance: Click through for our independent reviews of different models in each category and advice on where to buy them at the best price. Which head / face material should I choose? An insert putter is the only putter type which have a different material (the "insert") inlayed into the face. You actually strike the ball with this insert material and not the material used to make the main part of the putter head itself. Milled putters are created from a single block of metal which is cut and shaved using a milling machine until it's the exact shape desired. You can tell milled putters from the arc shaped marks on the putter face made by the milling machine. Milling is the only way to make putters which have complex shapes featuring cavities and scoops out of 303 stainless steel which is generally accepted as giving the best feel of any putter head material. Since milling is more labor intensive than casting a putter head (see below), milled putters are generally the most expensive putter type. Click here for reviews of milled putters from many different manufacturers. Which head design should I choose? Because of this you get far less twisting of the face on an off center strike and this makes the anser the most forgiving putter type other than the futuristic putters (see below). 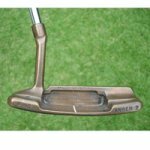 Click here for more info on Anser style putters. Click on the links below to find out which blade putter is the best with www.Best-Putter.com's independent, hands-on reviews, you'll also find where to buy them at the best prices! Click here for Best-Putter.com's independent reviews of blade putters. A center shafted putter is exactly what it seems to be - a putter where the shaft inserts into (more or less) the center of the head. They are usually face balanced, so they will best suit a straight-back-straight-through stroke. If your putting stroke is more of an in-square-in stroke, then you may well be better off with an anser style putter or a blade putter. For our independent review of numerous center shafted putters, click here. 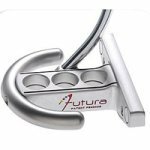 What we at Best-Putter.com call a "futuristic putter" is the most technologically advanced and forgiving putter type of all. You'll find most companies claiming a high "moment of inertia" (often abbreviated to MOI) on their futuristic putters, meaning that the putter resists twisting if you strike the ball off center. Whether you think the weird looks are worth it is up to you! Click here for loads of reviews of futuristic putters. Mallet putters are almost without exception face balanced, so will only really suit an square-to-square stroke. 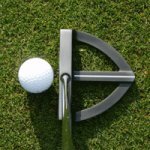 Click here for Best-Putter.com's reviews of mallet putters. An offset putter is one where the putter face is set further from the hole at address than the shaft. This achieved by either having a kink or a gentle curve in the shaft. The vast majority of putters are offset. The reason is that it feels natural and almost automatic to have your hands ahead of a putter whose face is offset. When you lead the putter through the stroke with your hands you will almost certainly putt better because a putter which is being led through the stroke twists less on off-center hits - Click here for reviews of offset putters from many different manufacturers. An offset putter is one where the putter face is set further from the hole at address than the shaft. This is achieved by either having a kink or a gentle curve in the shaft. You'll find that the vast majority of putters are offset. The reason is that it feels natural and almost automatic to have your hands ahead of the ball if you're using an offset putter. When you lead the putter through the ball with your hands ahead, you will almost certainly putt better. 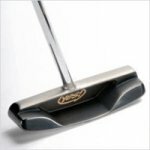 A putter head which is being led through the ball twists less on off-center hits - Click here for reviews of offset putters from many different manufacturers. Which putter balance should I choose? The weighting of a toe-weighted putter encourages the putter face to close through the ball. This is ideal if your stroke is an open-square-closed stroke (also known as a "barn door" or "arc" stroke). The style of stroke and a toe weighted putter go hand in hand and reinforce each other. 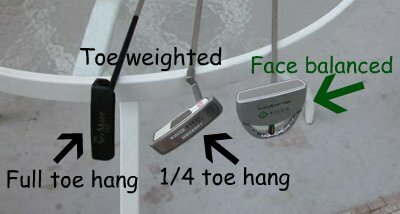 However, if you're trying to putt with a straight back straight through stroke, a toe weighted putter is absolutely the worst putter type for you (you want a face balanced putter instead). Click here for our reviews of toe-weighted putters. Not sure which putter type is for you? Read our article on choosing a putter to find out what is!